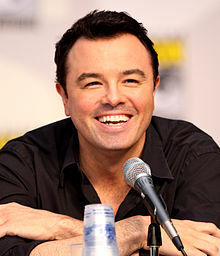 Seth Woodbury MacFarlane (born October 26, 1973) is an American actor, comedian, and voice actor. He is best known for creating adult cartoon television series. These series include Family Guy, American Dad! and The Cleveland Show. MacFarlane went to Rhode Island School of Design (RISD), a school in Rhode Island where he studied animation. He made a short cartoon movie named, The Life of Larry during his senior year. He worked at Hanna-Barbera writing and making episodes of Johnny Bravo. FOX, a media network, saw The Life of Larry and offered him $50,000 to make a pilot. MacFarlane is a supporter for the Democratic Party. In 2015, MacFarlane revealed support for Bernie Sanders on the 2016 U.S. presidential election, and he introduced Sanders on a Los Angeles rally. On the morning of September 11, 2001, MacFarlane was scheduled to return to Los Angeles on American Airlines Flight 11 from Boston. After having a hangover from last night's celebrations, and after getting his departure time incorrectly (8:15 a.m. instead of 7:45 a.m.) from his travel agent, he arrived at Logan International Airport about ten minutes too late to board the flight as the gates had been closed. Fifteen minutes after departure, American Airlines Flight 11 was hijacked, and at 8:46 a.m. it was flown into the North Tower of the World Trade Center, destroying the airplane, and killing everyone on board. In August 2011, Fox ordered a 13-part updated series of Cosmos: A Personal Voyage. MacFarlane will co-produce with Anne Druyan and Steven Soter. It will be hosted by Neil deGrasse Tyson. The series will be broadcast on Fox in 2013. Seth MacFarlane is working on his fifth animated series with Alex Borstein and Gary Janetti. No broadcast date has been given. It will show a family and will have a female lead role. Bob Merriam (Emily Gilmore's lawyer; on the phone) Episode 2.21: "Lorelai's Graduation Day"
2004–2005 Star Trek: Enterprise Engineer Episodes 3.20: "The Forgotten" and 4.15: "Affliction"
2010 Phineas and Ferb Jeff McGarland Episode 2.33: "Nerds of a Feather"
↑ "PICS: Seth McFarlane Dating Game of Thrones' Emilia Clarke!". Retrieved September 27, 2012. ↑ "Seth MacFarlane's Federal Campaign Contribution Report". newsmeat.com. Archived from the original on January 5, 2012. Retrieved 2008-09-30. ↑ Seth MacFarlane Introduces Bernie Sanders at Los Angeles Rally. ↑ "Full Frontal TV" Q&A: Head of the Family". Penthouse. September 2007. ↑ 5.0 5.1 "DVD Interview: 10 Questions with FAMILY GUY's Seth MacFarlane – Part Two". ManiaDVD. Retrieved 2007-12-21. ↑ 9/11 Investigation (PENTTBOM)[dead link]. FBI National Press Release, September 2001. Retrieved 2007-12-21. ↑ "Fox Orders Seth MacFarlane's 'Cosmos: A Space-Time Odyssey'". The Hollywood Reporter.